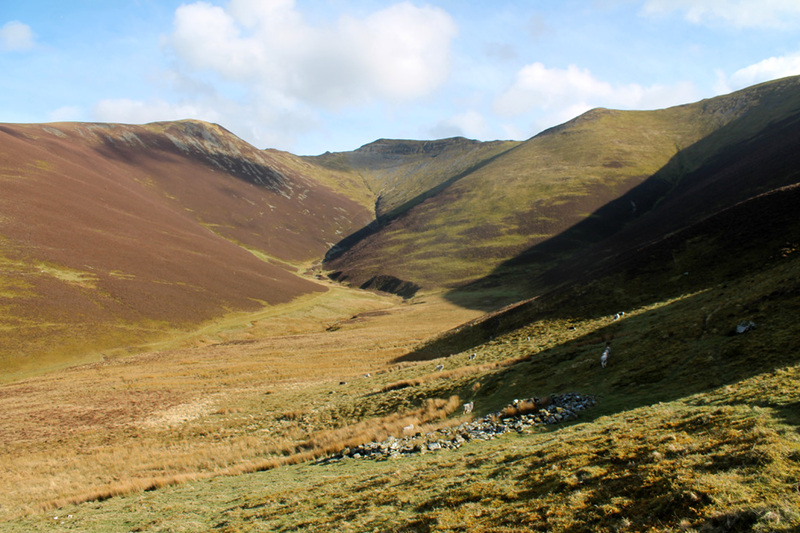 " The Hopegill Valley and Dodd (et al)"
Date & start time: Sunday, Monday and Tuesday 27/28/29th March 2016. 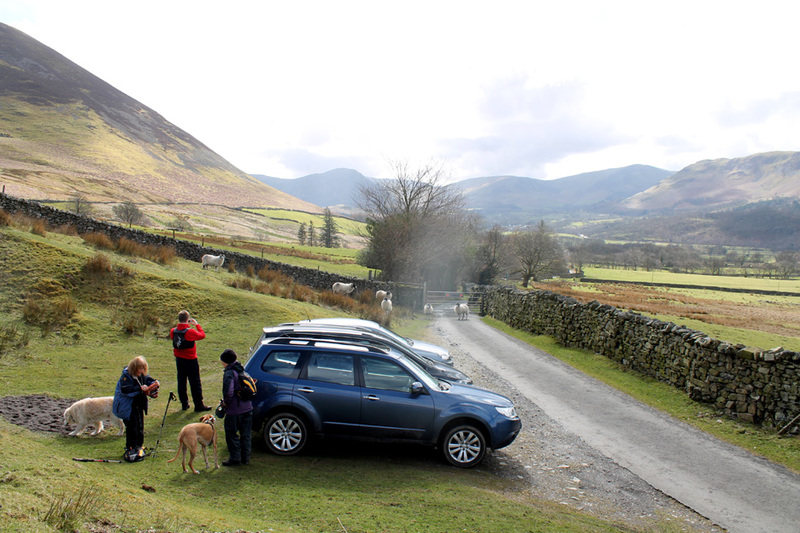 Places visited : The Hopegill Valley and Dodd. 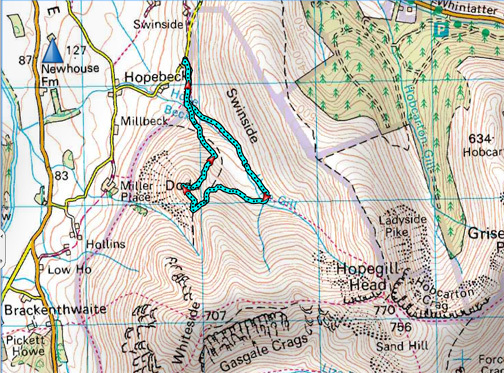 Walk details : 2.6 mls, 1000 feet of ascent, 2 hour 15 mins. 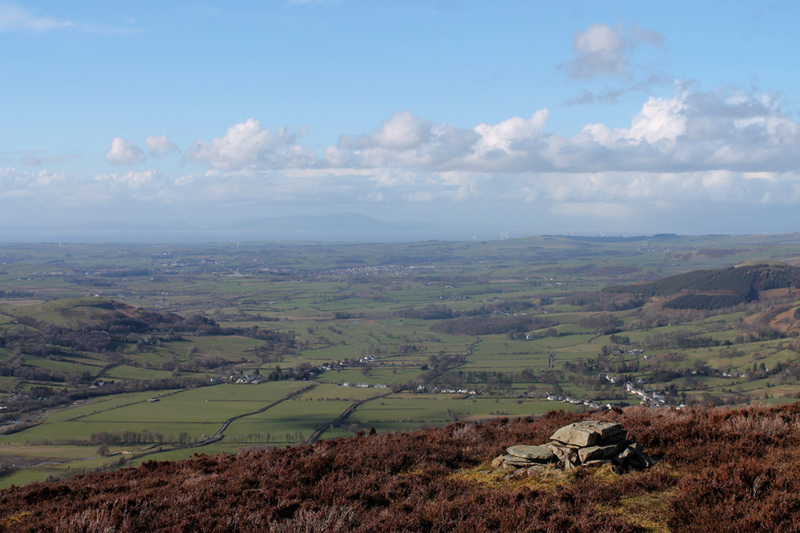 Highest point : Hopegill's Dodd fell, 1475 ft - 454m. 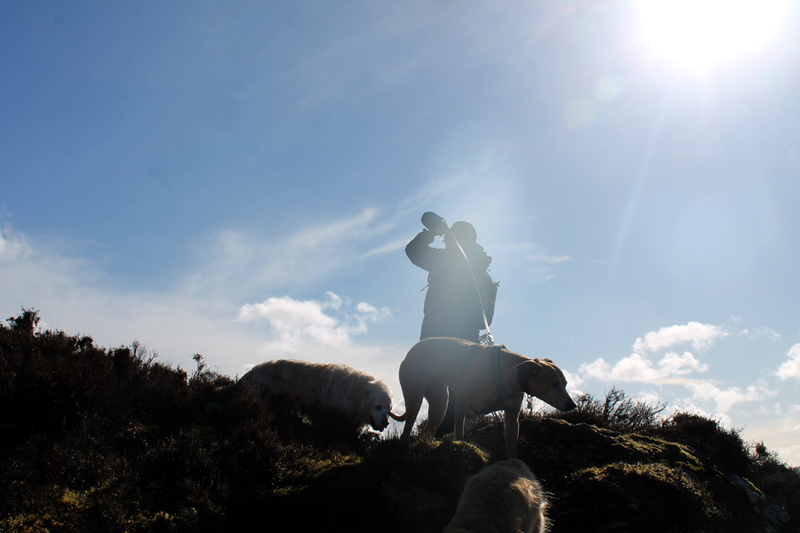 Walked with : Jo, Simon, Ann and our dogs, Amber, Harry and Dylan. with guest appearances from Dee and John and Pat on the other days. 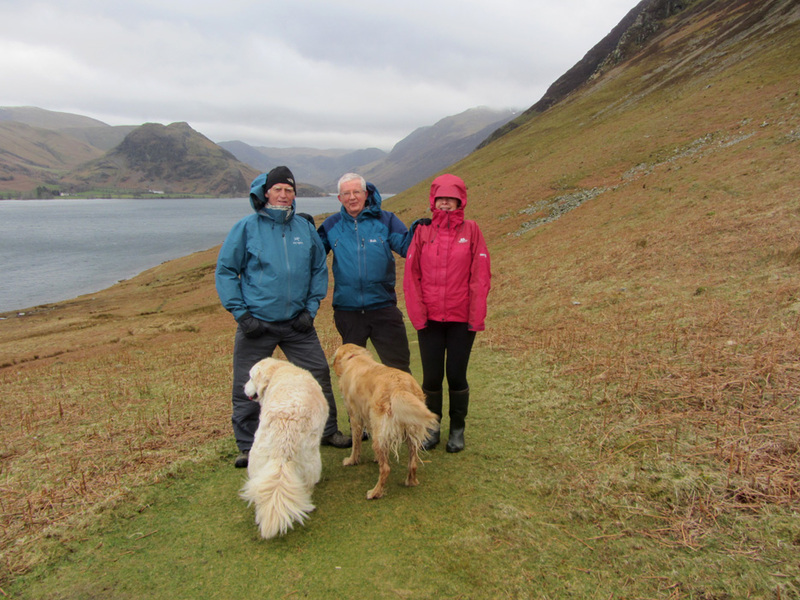 Weather : Sunny for the bigger Monday walk, overcast for the others. 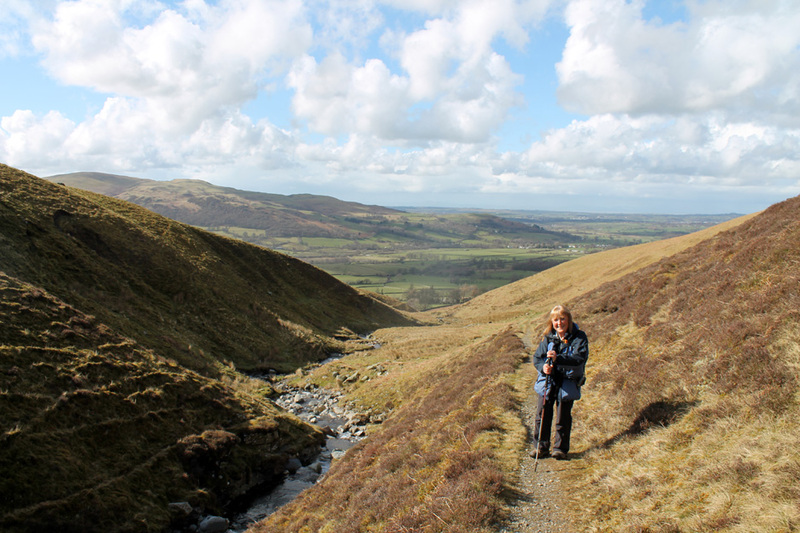 A series of photos of recent walks, the main photographic one being Monday's outing in the sunshine in the Hopegill Valley. 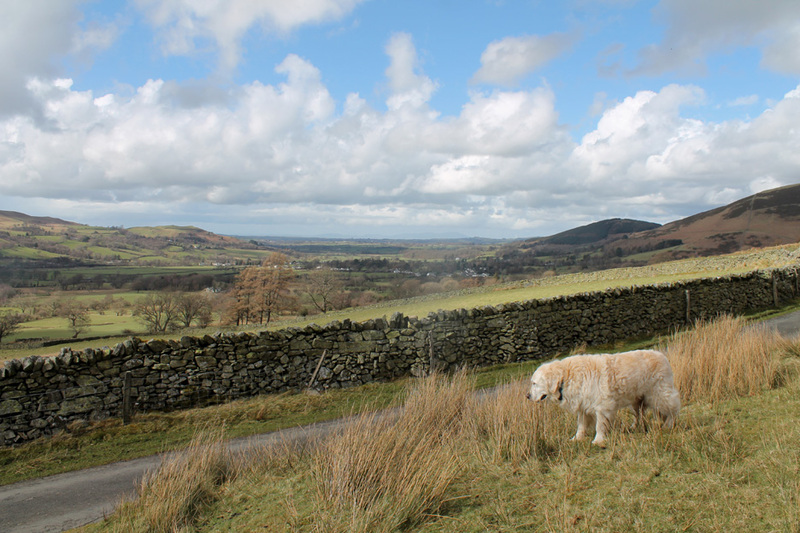 Two shorter local walks reflect the preferences on the day and the nature of the weather looking out from our window on the Lakes. 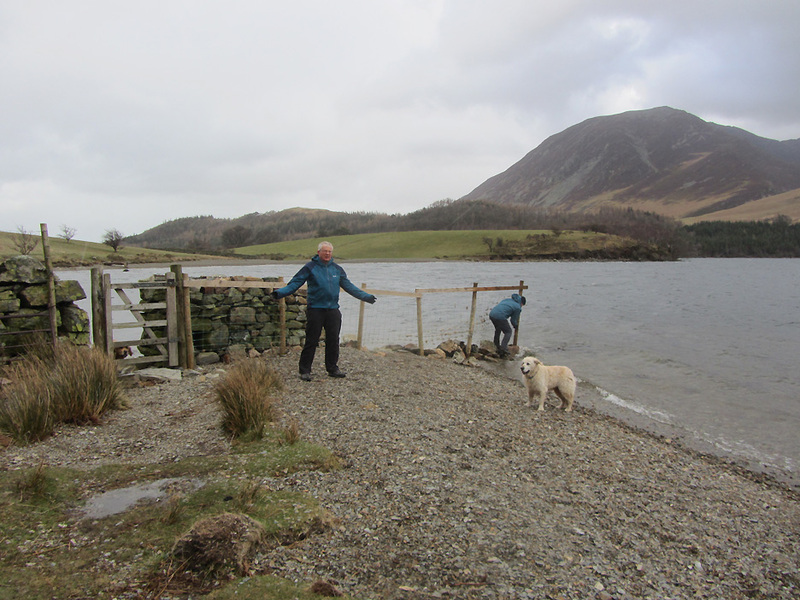 First an overcast and very windy Sunday so it must be Crummock Water. 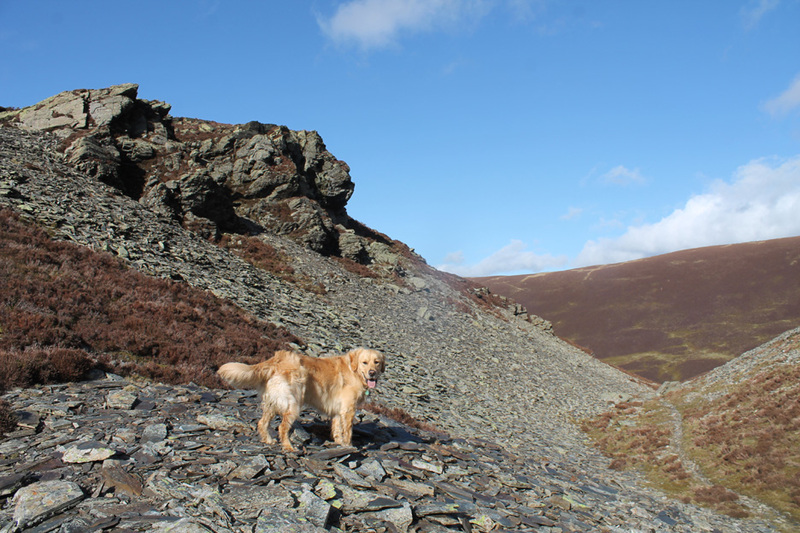 We thought a walk to Low Ling Crags would be a good idea until we tested the strength of the wind. John and Dee who were over from Durham for the weekend. Afte a few large drops of cold rain we turned to place the wind on our backs . . . the change of plans found us heading for the beach at Peel. While John test the strength of the wind . . . I re-erect the fence blown down in the recent poor weather. It lasted in vertical mode for all of four minutes ! 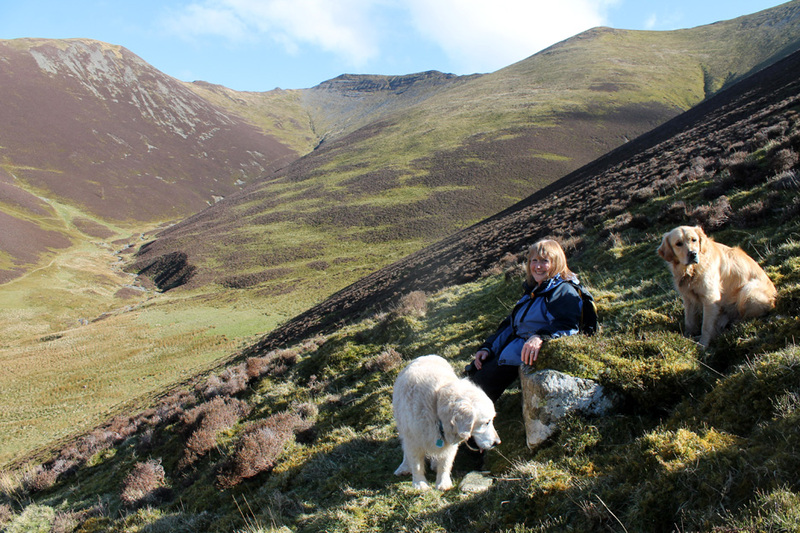 Sunday another friend Pat joined Ann and I for a short walk on Ling Fell, a walk to exercise the dogs and give us some fresh air. so Mike would take him home while Pat thought a second walk (and a chat) would be a nice idea. No rain this time but it was still rather cool in the breeze that was blowing across the open fell. Leaning into the wind . . . or is the picture skewed ? 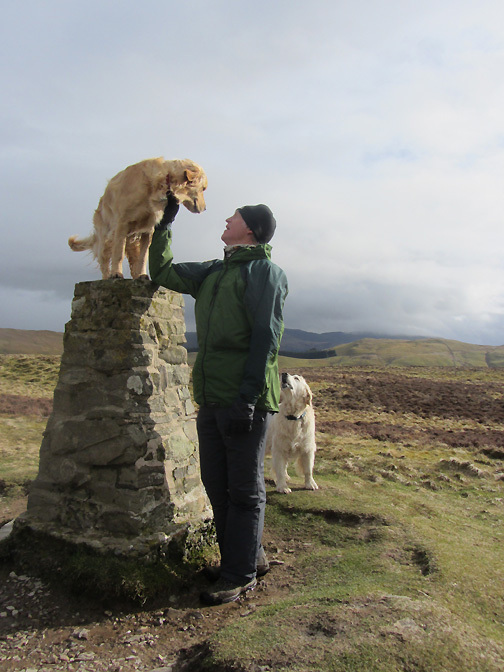 It has been a while since Dylan climbed a trig point. Hold your cursor over the picture to help him down. Tea and buns back at Pat and Mike's place afterwards . . . very civilised ! 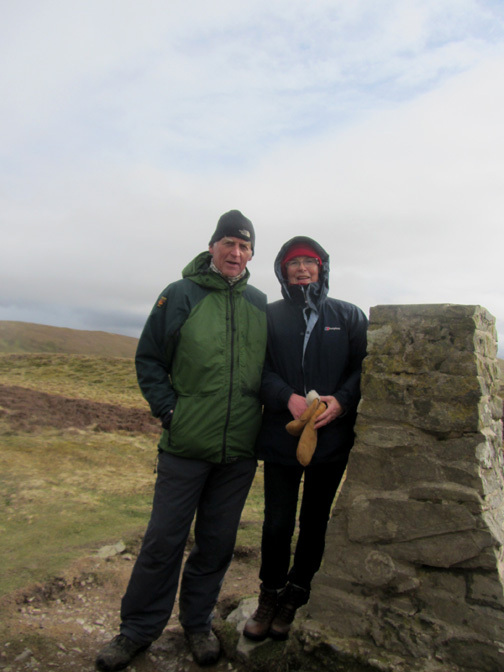 On Monday Simon and Jo were both in the area for a few days so today would be a great day to meet up for a walk. Lunch at home and a catch up while the weather cleared and then it was time to decide where to go for a two hour stroll. The answer was staring us in the face . 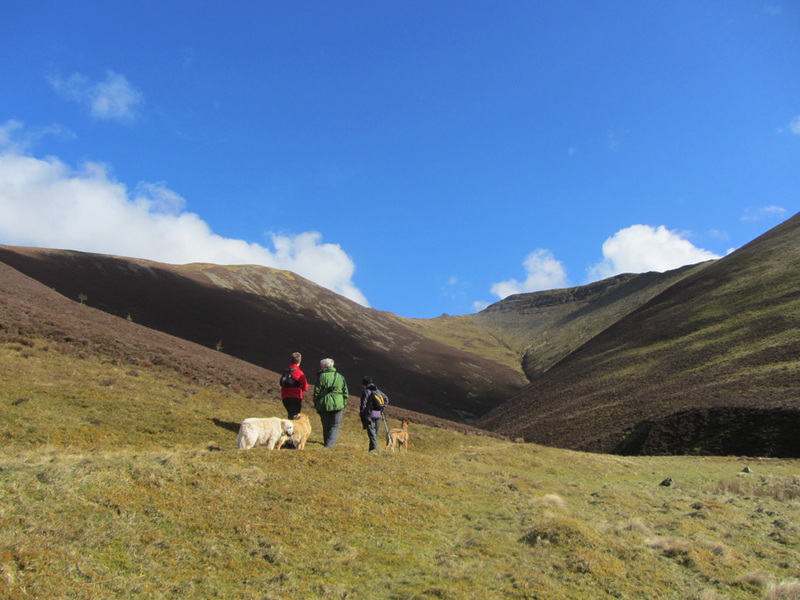 . . Dodd, the Hopegill outlier that is centre stage in this picture. A short drive now the sun had come out and with the lengthening days, the narrow valley would be full of sunshine. 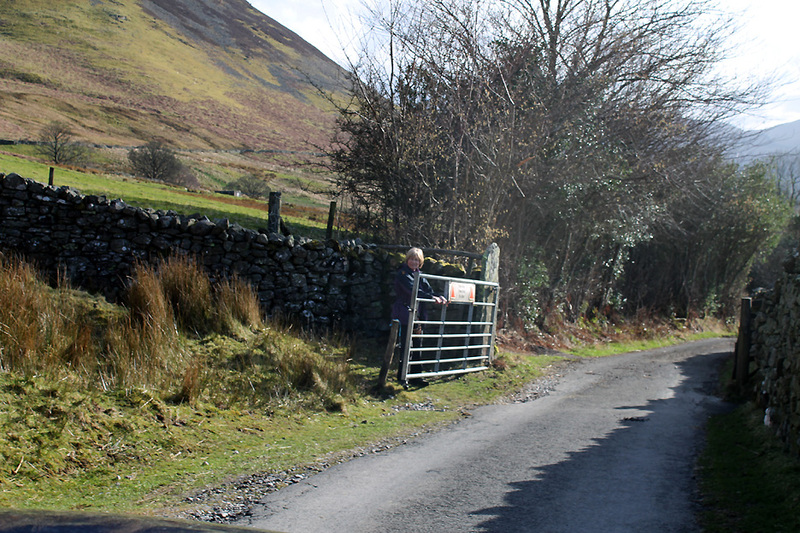 Parking beyond the fell gate on the Swinside road. This is virtually the reverse of the last picture . . . except the cottage is hidden by the tree and dirty mark on the camera lens. It has cleared to a fine afternoon . 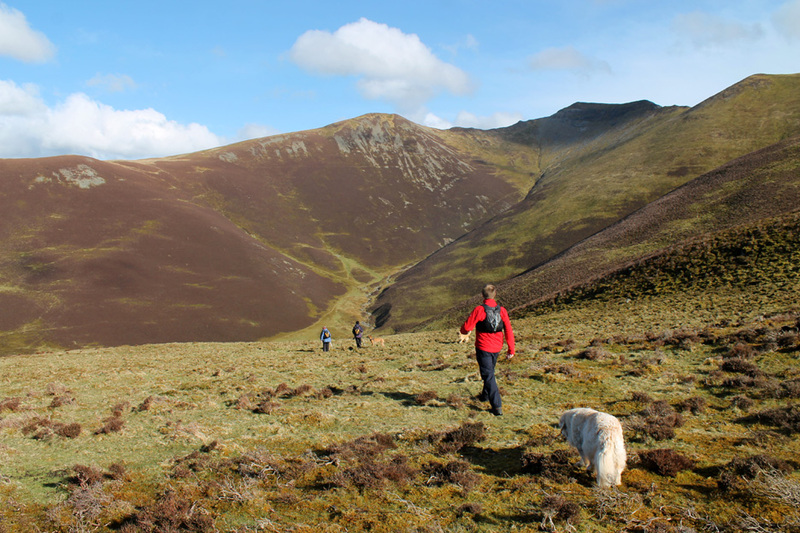 . . with colourful views down the Lorton Valley and all the way to the Scottish coast. a small fence to protect some local frogs spawn. has become wetter in recent years. a patch of frog spawn. will now give it a wide berth. 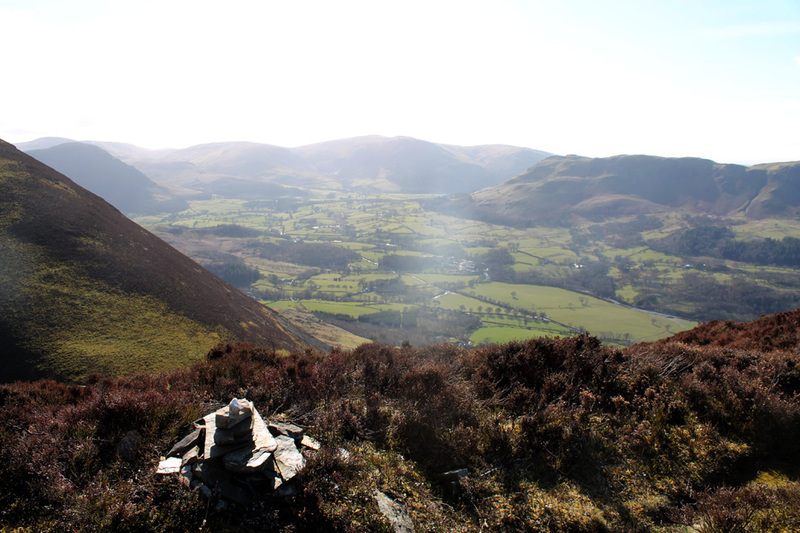 at the head of which is the flat-topped, almost table-top mountain summit of Hopegill Head . . . see it all makes sense ! 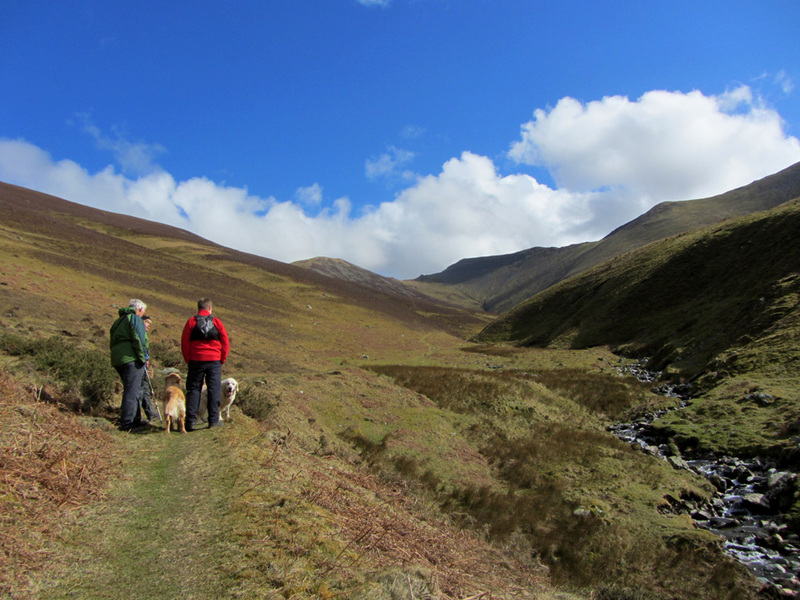 The more pointed summit on the right is Dodd, but we'll pass on a direct ascent today. 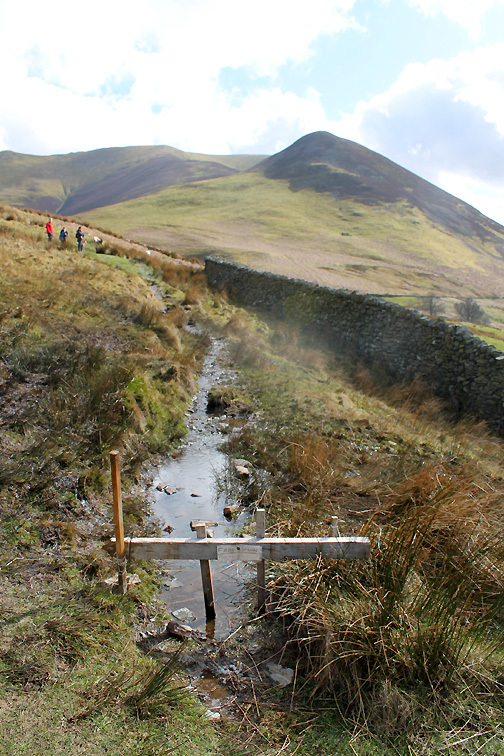 That crag below the summit is the turn round point of the Loweswater Show fell race by the way. Simon and Jo . . . plus Jo's Amber. 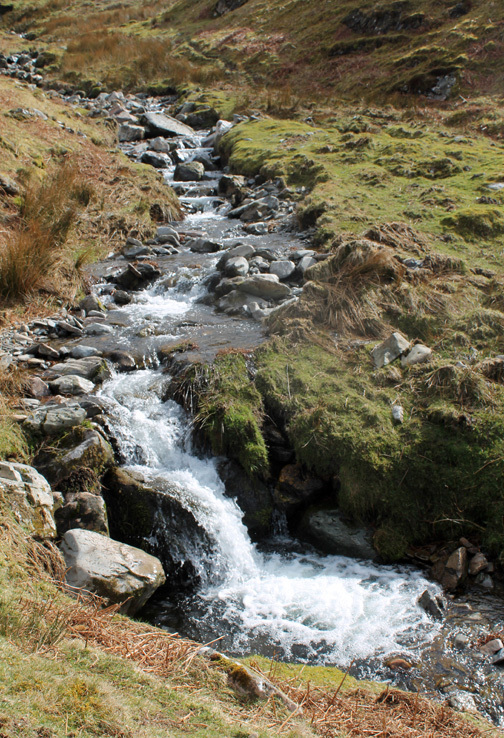 The sparkling waters of Hope Beck. A nicely graded path slowly climbs up into the valley. Mustn't forget to take a picture of the camera woman responsible for most of today's shots. Looking up and right to the extended Whiteside Ridge . . .
. . . and ahead and left to Ladyside Pike and the rocky summit of Hopegill Head. A change of direction at the end of the flatter upper section. 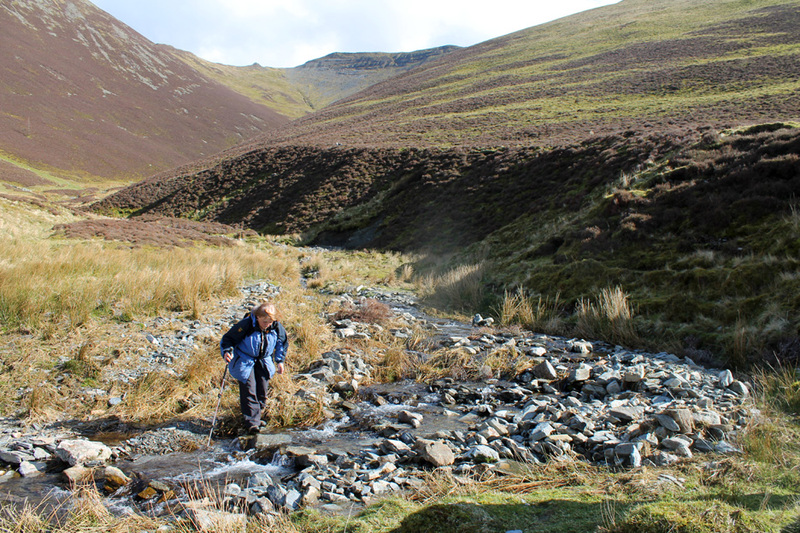 We cross the beck to try and pick up a sheep trod seen climbing diagonally up towards our chosen summit. No rush today so time to sit and enjoy the views. Ahead is the false valley that is the hause between Dodd and the main ridge. Smooth on the left hand side, the right has a small but dramatic slate cliff.
" Queen Victoria would not have been amused " . . . by the look of the rock formation. 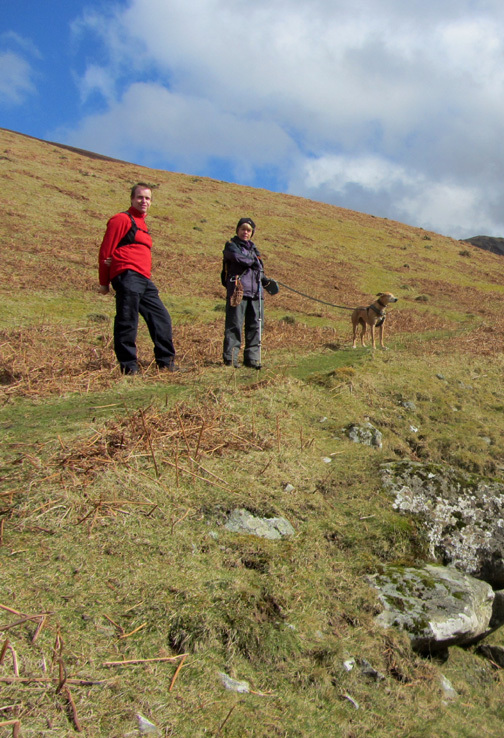 Whilst Ann and Jo climbed one side, Simon and I walked on in order to climb the other. 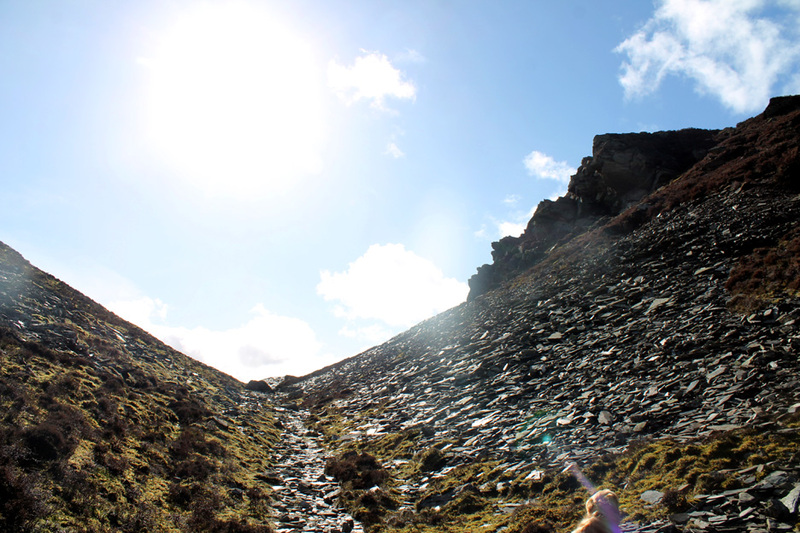 The crags are now illuminated by clear sunshine from behind us, rather than shining into the lens. The view south west up the Lorton Valley to the Loweswater Fells of Gavel, Blake and Burnbank. Mellbreak is just showing on the left, Low Fell taking up the right hand side of the picture. Even I could see the smudge on the lens after this photo of Jo swigging a drink from her water bottle. The afternoon was proving much warmer than expected. Three quarters of the party . 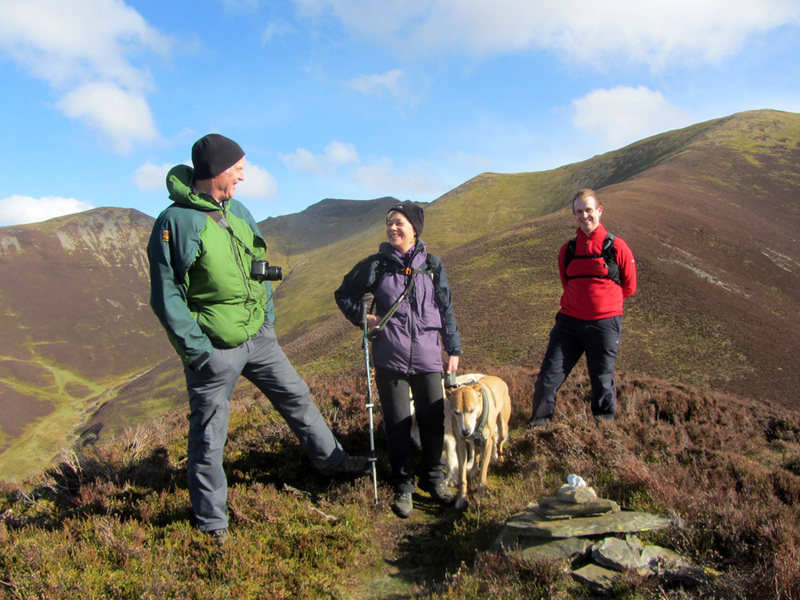 . . myself, Jo and Simon on Dodd summit. Either I've grown, Jo's shrunk . . . or the perspective of the photo is causing an optical illusion. 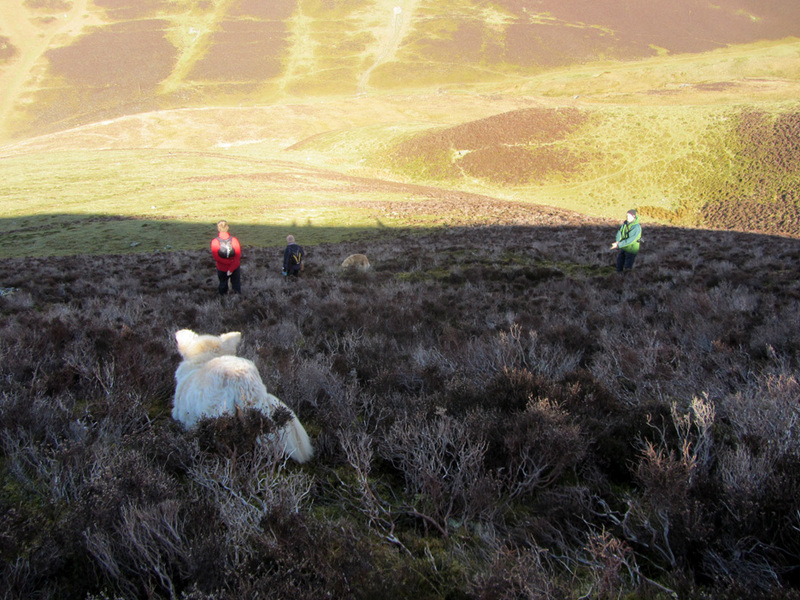 So far and so close, we decide to walk the last hundred yards to the viewpoint cairn on the lower part of the outlier. From here we could look down on the whole valley laid out before us . . . and then across to a wider seascape, with Criffel away in the haze. A slightly off-piste route to avoid the hundred yard climb back to Dodd summit cairn, as we head back down to the valley. The angle of the sun was such that only the top half of people and the ears of Harry were illuminated. 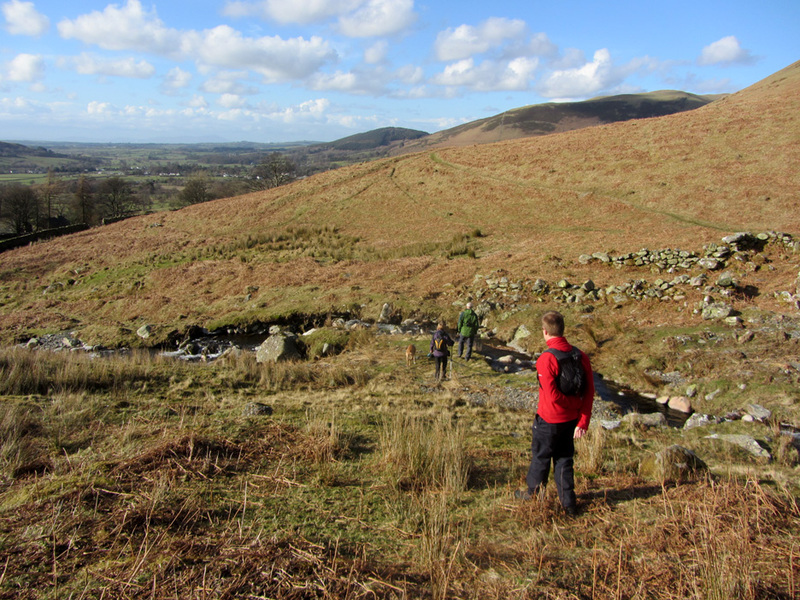 Down to the ruined sheepfold . 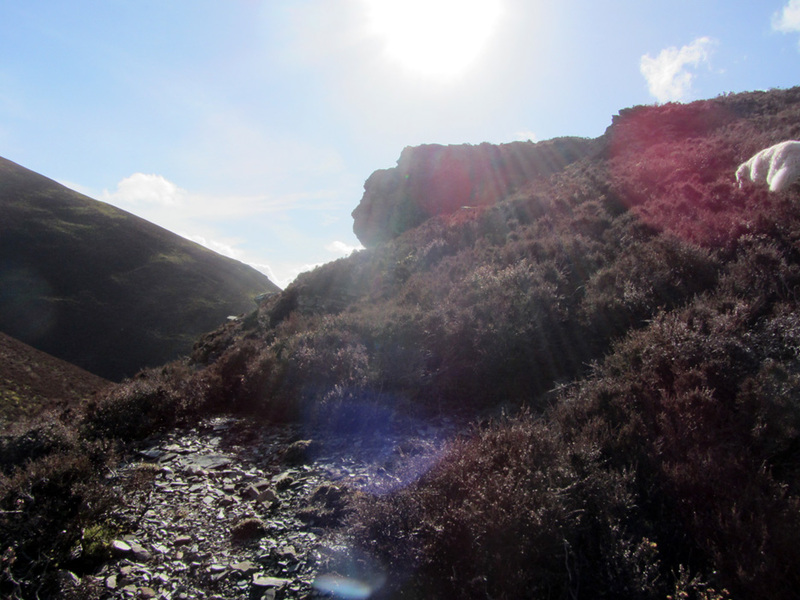 . . and the classic view of Hopegill Head returns. 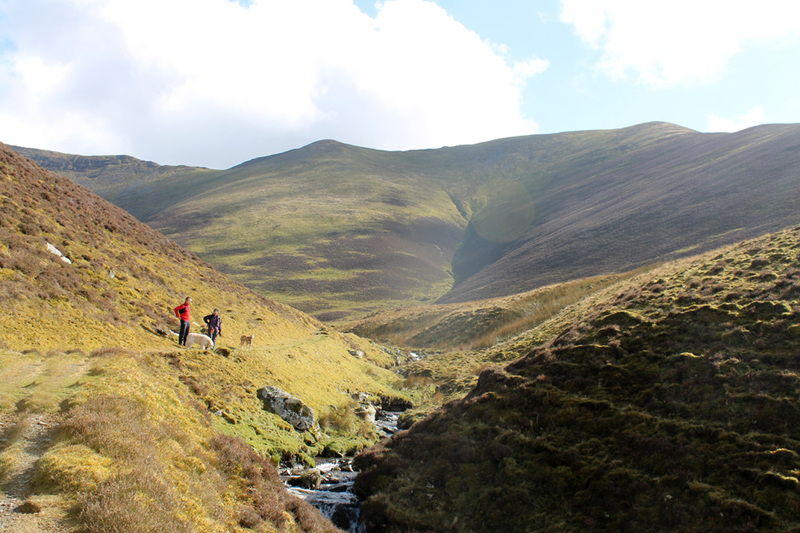 We drop down the spur and head for a stream crossing lower down the valley this time. Another old sheep fold is revealed while the winter bracken is laid low . . . it will be virtually hidden later on in the year. 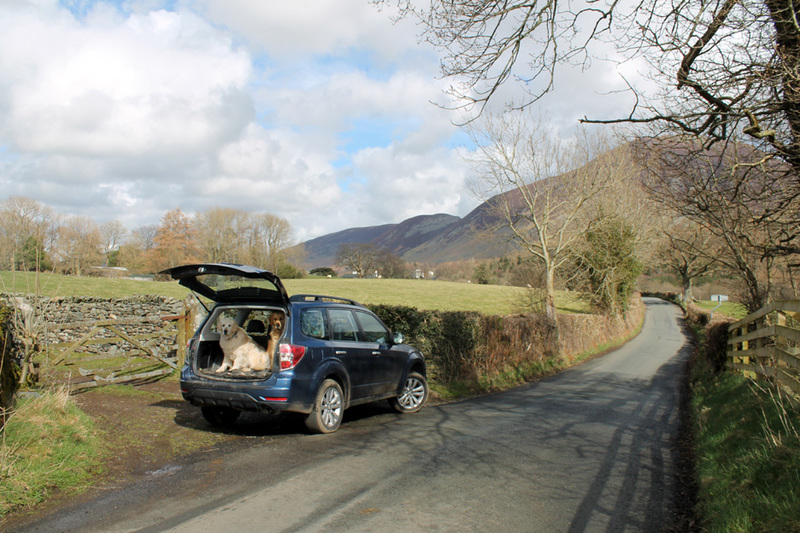 Back to the car now, avoiding walking in that frog spawn on the wet path. One last task . . . last one back to the car has to stay out and open the gate ! This site best viewed with . . . someone to open and close the gates.